I have made no secret of my love of puppets as evidenced by various blog posts over the last nine months and several dodgy pictures floating around the blogosphere. So a post on Linguahelp captured my attention. I hadn’t discovered the Linguahelp blog before, probably because my school doesn’t subscribe to Linguascope. However, my Google alerts today included a link to the most recent post entitled Gimmick sites to help in the MFL classroom and it made lots of sense to me. 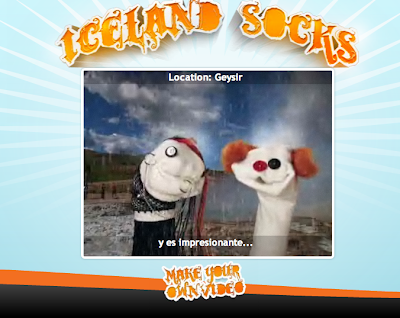 I’m always up for finding innovative and captivating ways of engaging language learners so the idea of using the Iceland Socks site seemed appealing – and I tried it out! The idea is simple – you build up a mini ‘film’ using sock puppets, subtitles and a series of animated locations, which you can then email to friends – but the usefulness to language learning is immediately apparent. The puppets speak a ‘Pingu-esque’ nonsense chatter, which is made into intelligible dialogue by the user. Students could use the site to build up practice dialogues in a very up-to-date, hi-tech fashion – instead of potentially awkward and embarrassing role-play in class, they can create YouTube style cartoons full of the language they are learning. To top this, the resulting ‘films’ can then be emailed to the teacher for checking later! Not perhaps the original intention of the site designers, but a fun adaptation to liven up the lesson. and you can see the results of my first attempt by clicking on the title, Lucía and Miguel go to Iceland. In fact, it was so much fun, I made another! Mimi and Roberto go to Iceland. And I’ll probably make more! Feel free to leave me links to your videos in the comments box – would love to see what others dream up!